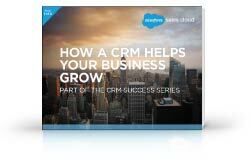 How a CRM Helps Your Business Grow. Business may begin with a handshake — but once the customer relationship begins, your challenge is to maintain it. The right CRM will help you build deeper, more meaningful relationships with your customers while you build and scale your business. Download your free e-book today and start growing like nobody’s business.